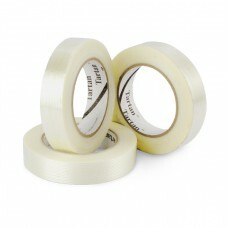 Glass filament reinforced tape for lightduty strapping, bundling and reinforcing. Fiberglass filaments embedded to increase strength and integrity of the tape. It has a synthetic rubber resin adhesive with good adhesion to most fiberboard surfaces, and a variety of plastics and metal surfaces. Filament tapes are designed for applications needing both the dielectric strength of polyester film and high mechanical strength of glass fibers. Filament Tape 8934 is a general purpose clear fiberglass-reinforced tape with a synthetic rubber resin adhesive, ideal for light duty strapping, bundling and reinforcing. A synthetic rubber resin adhesive provides good adhesion to most fiberboard surfaces, and a variety of plastics and metal surfaces.